Half-Life 2: Episode One is the first of three stand-alone expansions to Half-Life 2. It picks up moments after the first game ended - which you may recall was on a massive cliffhanger - and nicely sets up the events of Episode Two. Before the events of Half-Life 2, the Earth was invaded and subjugated by a ruthless interdimensional alien race known as the Combine. Inhibiting humanity's desire to procreate with suppression fields, draining the oceans and gradually transforming the surviving humans into cybernetic slaves or indoctrinated soldiers, the Combine are clearly not very friendly. However, aided by the alien vortigaunts who used to be slaves of the Combine but were liberated by the actions of your character, Gordon Freeman, at the end of the original Half-Life, humanity has formed a resistance. Freeman's unexpected arrival in City 17, the main Combine base of operations in Eastern Europe, triggered a mass-uprising against the Combine. At the end of Half-Life 2, Gordon and Alyx Vance infiltrated the Citadel and defeated the plans of the Combine and their ally, Dr. Wallace Breen. Unfortunately, although their plan succeeded, the zero-point energy generator at the top of the Citadel exploded, apparently incinerating Alyx, although Gordon was 'rescued' once again by the mysterious G-Man. Episode One picks up moments later as the G-Man suddenly finds his powers neutralised by a bunch of vortigaunts, who teleport both Alyx and Gordon to freedom. The resistance is evacuated City 17, but as thousands of people flee for safety the defensive shields around the city collapse and dangerous wildlife starts flooding in, causing havoc. Gordon and Alyx's task in Episode One is simple: to re-engage the Citadel's shields to stop the reactor exploding for a few hours longer, and then to get the hell out of the city. Episode One is impressive for distilling the Half-Life experience down to a few intense hours of fun. The episode isn't as long as any of the other games or expansions in the series, clocking in at around four hours in length, but it does cover a fair amount of ground. New weapons are disappointingly nowhere to be seen, but there are some new enemies and some interesting set pieces. As usual, combat is fast and furious and the physics puzzles aren't quite as blindingly obvious as in HL2 itself. They've also generously increased the battery life of your torch, which given that chunks of the game take place in darkness as you have to fight off zombie and headcrab hordes is a good thing. Much of the game's enjoyment comes from having Alyx by your side for most of the game. She is easily the most impressive allied NPC to ever appear in an action game, and her reactions in a few situations are surprisingly lifelike. However, Valve definitely missed a trick by not allowing a co-op mode with another player controlling her. Episode One (****½) is a fun game and an enjoyable addition to the series, if you can stomach yet another cliffhanger ending (although that is eased due to the fact of Episode Two already being available). 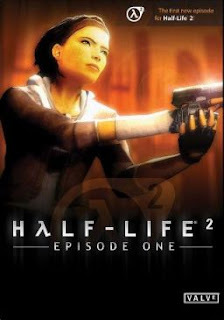 The game is available in the UK as part of The Orange Box (PC, 360, PS3), and the Half-Life 2 Episode Pack (PC), and in the USA as part of The Orange Box (PC, 360, PS3) and the Half-Life 2 Episode Pack (PC).